There are an overwhelming number of functional concrete surface prep procedures, from concrete grinding to glue removal and more. Sometimes concrete surface prep includes repairing bad polishing jobs and staining projects gone awry. 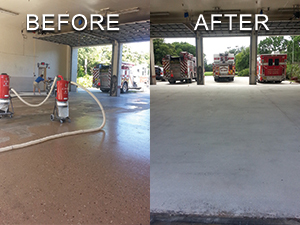 At CEI Surface Pros, we feel that proper concrete surface prep, including grinding, restoration, cleaning and profiling, is the most important part of the flooring maintenance dollars you can save. We provide concrete surface prep services for a wide variety of residential, commercial, and industrial clients, dramatically improving the appearance of concrete floors in hotels, art studios, retail stores, shopping malls, water treatment facilities, medical storage facilities, warehouses and other facilities requiring specialized coatings. With any concrete repair we first figure out what caused the damaged, do the necessary preparation of removing any unsound concrete and contamination, and then create a repair plan to solve the problem. We have the experience and in most cases the certifications to install almost any type of repair material from high quality concrete to various polymers leading to higher bond strength and durability. Regardless of the type of repair, we can say with certainty that the end result will blend as closely as possible to the surrounding area. Using concrete joint sealant to seal concrete expansion joints and concrete contraction joints is an important part of maintaining the integrity of the concrete. Installing the proper kind of concrete joint sealant will help protect the structure from moisture damage caused by rain, wind, gravity, capillary force, and surface tension. We can repair and restore cracked, uneven concrete. Contact us online or call (239) 455-1167 for a FREE estimate on concrete surface prep services throughout South Florida – Port Charlotte, Ft. Myers, and Naples. We will travel up as far as Sarasota.